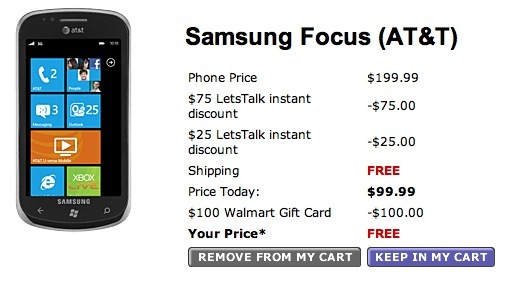 The Samsung Focus is undoubtedly the WP7 device to have in the USA, and has received the brunt of attention from everyone, and is remarkably hard to get hold of now, having sold out from many locations. It turns out that everyone’s least favorite retailer might just have you covered: Walmart is selling the phone for free on a new contract. The phone is $99.99, but you get a free gift card worth $100 applied at the checkout, so the device is yours for not a cent. You can’t ask for a better deal than that! Lets just hope they still have a few in stock. I ordered in walmart but I cancelled it I found a better deal with no activation fee, plus on top of that you will receive $30 bill credit and NO Activation fee of $36. Phone price is $0, you do not have to wait for your $100 walm,art rebate card, Also, if you purchased throught this link http://wirefly.tellapal.com/a/clk/8hFsp it will give you extra $25 for referral bonus and use this coupon code for free 4G memory sdhc card WIREFLY2GMC4U. Goodluck!! !